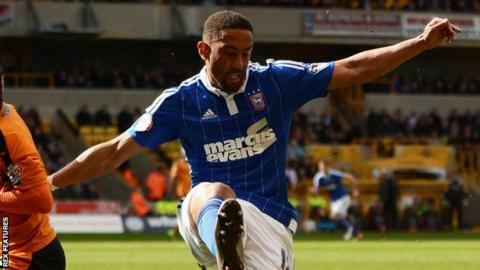 Wolves and play-off chasing Ipswich played out a tame draw at Molineux. Ipswich could have been ahead after 18 minutes when Liam Feeney hit the post with a fierce drive. Town's Brett Pitman also had an effort cleared off the line by Kortney Hause late in the first half after the 20-year-old Wolves defender had given the ball away to the striker. Matt Doherty had Wolves' best chance, but his effort was saved by visiting goalkeeper Bartosz Bialkowski. The result means Ipswich boss Mick McCarthy extended his unbeaten record against former club Wolves to six games since being sacked as manager in February 2012. Town stay eighth in the Championship, but are now five points off the play-off places having managed just one win in their past four games, while Wolves stay in 12th place. "I felt that defensively we did well and I was pleased that the back four looked quite cohesive and competitive and we needed to be as otherwise at the start of the game Ipswich would have swept us away. "It was hard to get our passing game going through midfield which has been a feature when we have got it right this season. "While we are pleased defensively we want more. We want to be able to pass the ball and flow and it through midfield and create chances and score goals which can give us a chance of progressing. "We have been a mid-table side this season and that is what it has been. "I view it as a compliment (on being linked with the Aston Villa job). I can't help but feel it is a compliment when clubs of that ilk think that I am doing a good job as a manager bearing in mind that I have got two similar clubs promoted. "But I have for a job here and there is nothing I can do about whatever they are saying. I won't even talk about what another job might entail. "We have seven games and we want to get in the play-offs. My focus is on trying to get in the play-offs. "We have got two home games coming up now and I do feel that we are going to have to win them to be in the mix." Match ends, Wolverhampton Wanderers 0, Ipswich Town 0. Second Half ends, Wolverhampton Wanderers 0, Ipswich Town 0. Attempt missed. Matt Doherty (Wolverhampton Wanderers) header from the centre of the box is close, but misses to the right. Assisted by Danny Batth following a corner. Attempt blocked. Matt Doherty (Wolverhampton Wanderers) right footed shot from the centre of the box is blocked. Assisted by James Henry with a cross. Corner, Wolverhampton Wanderers. Conceded by Cole Skuse. Offside, Wolverhampton Wanderers. James Henry tries a through ball, but Adam Le Fondre is caught offside. Delay in match Danny Batth (Wolverhampton Wanderers) because of an injury. Substitution, Ipswich Town. David McGoldrick replaces Liam Feeney. Corner, Wolverhampton Wanderers. Conceded by Tommy Smith. Attempt saved. Conor Coady (Wolverhampton Wanderers) right footed shot from outside the box is saved in the centre of the goal. Assisted by George Saville. Attempt blocked. Christophe Berra (Ipswich Town) header from the centre of the box is blocked. Assisted by Kevin Bru with a cross. Corner, Ipswich Town. Conceded by Carl Ikeme. Attempt missed. Kevin Bru (Ipswich Town) right footed shot from the left side of the box is close, but misses to the left. Assisted by Freddie Sears. Freddie Sears (Ipswich Town) wins a free kick in the defensive half. Attempt missed. Christophe Berra (Ipswich Town) header from the centre of the box misses to the right. Assisted by Kevin Bru with a cross following a corner. Corner, Ipswich Town. Conceded by Danny Batth. Attempt missed. James Henry (Wolverhampton Wanderers) right footed shot from outside the box misses to the right. Hand ball by Luke Varney (Ipswich Town). Attempt missed. George Saville (Wolverhampton Wanderers) left footed shot from the left side of the box is high and wide to the right. Attempt saved. Matt Doherty (Wolverhampton Wanderers) right footed shot from the left side of the box is saved in the centre of the goal. Assisted by James Henry with a through ball. Offside, Ipswich Town. Liam Feeney tries a through ball, but Luke Varney is caught offside. Attempt blocked. Kevin Bru (Ipswich Town) right footed shot from outside the box is blocked. Attempt blocked. Liam Feeney (Ipswich Town) left footed shot from outside the box is blocked. Assisted by Luke Varney. Attempt missed. Luke Varney (Ipswich Town) header from the centre of the box is too high. Assisted by Liam Feeney with a cross. Attempt blocked. Cole Skuse (Ipswich Town) right footed shot from outside the box is blocked. Substitution, Ipswich Town. Kevin Bru replaces Ben Pringle. Substitution, Ipswich Town. Luke Varney replaces Brett Pitman. Substitution, Wolverhampton Wanderers. Adam Le Fondre replaces Michal Zyro. Foul by Liam Feeney (Ipswich Town). Attempt saved. Brett Pitman (Ipswich Town) header from the centre of the box is saved in the bottom right corner. Assisted by Liam Feeney with a cross. Jonathan Douglas (Ipswich Town) wins a free kick in the attacking half. Corner, Ipswich Town. Conceded by Matt Doherty. Offside, Wolverhampton Wanderers. Conor Coady tries a through ball, but Michal Zyro is caught offside. Substitution, Wolverhampton Wanderers. Joe Mason replaces Jeremy Helan.